It´s easy to see in Windows 10 when running on the x32 (x86) or x64 installed version of Windows! 1.) ... Find out if is Windows 10 x64 or x32 / 64 or 32 Bit! 2.) ... Difference between x32 and x86 Windows? See also: ► How to find Windows 10 Creators Update on my PC? 1.) Find out if is Windows 10 x64 or x32 / 64 or 32 Bit! Please start eg ope the ► Windows-Logo+X ► ControlPanel ► System in Windows-10! (Image-1) Windows 10 x32 or x64 on the PC? The links in the left pane provide access to additional Windows-10 system settings. Use Device Manager to change settings and update drivers on Windows-10. Windows-10 Remote settings to change settings for Remote Desktop, which you can use to connect from Windows-10 to a remote computer, and Remote Assistance, which you can use to invite someone to connect to your computer to help with a Windows-10 PC problem. Advanced system settings in Windows 10 for access and advanced performance, user profile, and system startup settings, including Data Execution Prevention, which monitors programs and reports possible security attacks. You can also change your Windows-10 virtual memory settings. See also: ► Where can I find the Windows 10 version and build number? 2.) Difference between x32 and x86 Windows? x32 and x86 is the same! See ►►► x86 and x32, what is what? 3. System protection for Windows 10. 4. 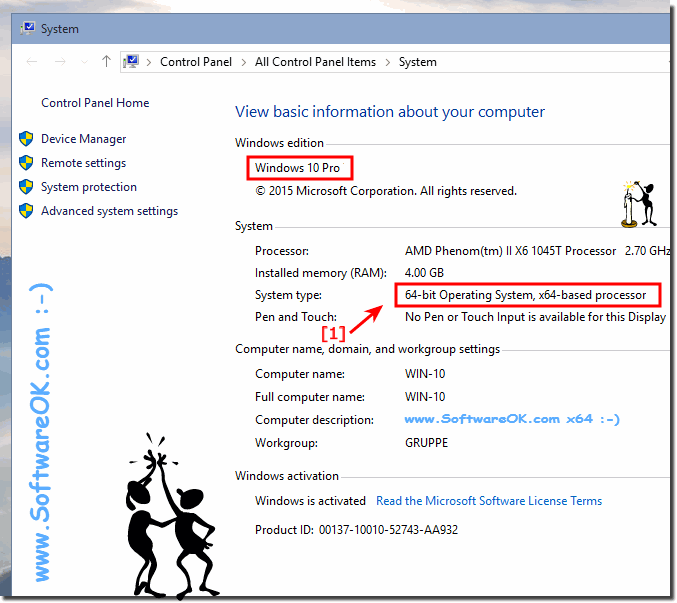 Advanced system settings in Windows-10. Windows-10 - FAQ-37: Do i have windows 10 x86, x64 or x32 and 32 or 64 Bit?